2012 is the year of the Action-RPG. Between Diablo 3, Torchlight 2, Path of Exile, Krater and a few others that slip my mind, the playing field is surprisingly crowded. Enter Heroes of Ruin, the prime portable contender in this genre, available on the Nintendo 3DS. 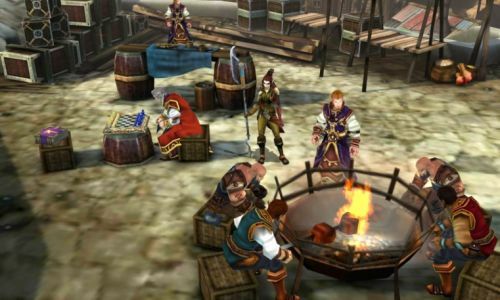 With it comes a veritable smorgasbord of co-op-friendly features, but is the game itself worth checking out? Players can create a character from one of four classes: the Vindicator, who is your paladin archetype, the Savage, a dual-wielding berserker, the Gunslinger who, well, shoots baddies with extreme prejudice, and the oddly-named Alchitect, a battlemage archetype. You can customize your character a bit, changing hairstyles, skin color and such (eat it, Diablo 3! ), name ‘em and send them out into the world. The plot is fairly generic and revolves around your hero helping NPCs within the hub city of Nexus and investigating the cause of a mysterious curse ailing Ataraxis, the Ruinlord of Nexus. Quests are of standard fare, requesting you kill certain enemies to advance the plot, or gather items for people in town. Environmental puzzles are scattered throughout the dungeons and serve to mix up the action. When playing online, you'll also receive a set of daily and weekly challenges, similar to what Bungie included with Halo Reach. With the Vindicator and Savage, combat feels very sluggish. Attempting to chain basic attacks to special abilities is a chore, and if you’re too quick on the trigger, some of your inputs will flat out be ignored. This wasn’t nearly as much of an issue when I played as an Alchitect, or when I had the Savage’s attack speed bonus up, but it’s definitely frustrating. The uneven framerate doesn’t help, either. It seemed to be slightly better if you play without 3D enabled, but your mileage may vary. Heroes of Ruin does a fairly good job of streamlining common ARPG functions. Potions and your quick-equip/sell abilities are mapped to the D-pad, and believe me, you’ll be making extensive use of that last one. Each class has three skill categories to power up, but calling them trees would be inaccurate. You can choose to bring three active abilities or buffs into battle with you by mapping them to the face buttons, and there are a smattering of passive abilities to put points into as well. Powering some abilities up to their maximum level allows their effect to affect other players, so picking a few to stick with is probably wise if you intend to play with friends (and why wouldn’t you?). Unfortunately, the abilities don’t really matter too much since it’s possible to just brute force your way through most of the game using only the auto attack and each character’s charge move. I’d find myself forgetting that I had extra abilities, which was a bad sign. Heroes of Ruin’s biggest flaw is that its loot system leaves a lot to be desired. In a dungeon crawler of this type, that’s a nearly criminal offense. When an item drops, you’ll be able to see if it’s better/equal/worse than what you’ve currently got on, but comparing gear in a more meaningful fashion is an exercise in futility. Worse, other than trinkets and rings, all of the drops are locked to specific classes, so you’ll constantly be showered in loot you can’t even use. It’s lucky then, that the quicksell hotkey is readily available, otherwise you’d have to haul all this stuff to a store.